This post is kindly brought to you by Kind Eye, who compensated me for this sponsored post. All product picks, tips and opinions are my own! One thing I love about the explosion of the green beauty movement is the number of healthy options on the market. One thing that’s frustrating about the green beauty movement is the number of healthy options on the market. While I adore being able choose from so many natural, nontoxic brands, there are some brand and product characteristics that speak more to my personal beauty philosophy. If I only use products that are cruelty-free with certified organic ingredients, that’s one set of filters. If I only use products that are cruelty-free with certified organic ingredients and contain 10 ingredients or less, that’s another set of filters. See how this can get tricky? This is where Kind Eye comes into play. Kind Eye is a new website that helps you discover the right personal care products for your particular set of beauty standards. Founder Rachel Murray launched the site to simplify the hunt for conscientious, clean beauty products. 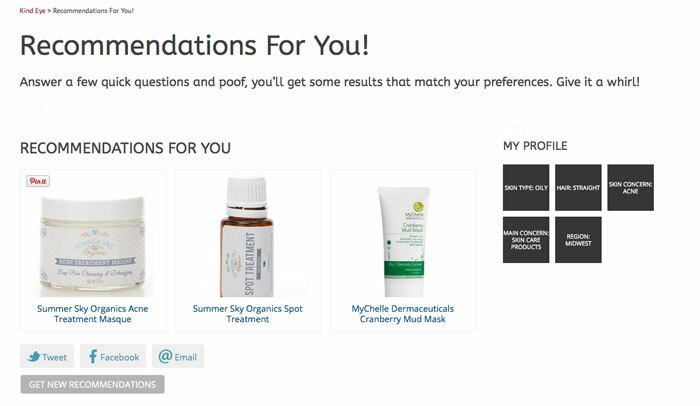 After you’ve decided what matters the most to your in your beauty products, it’s as easy as the click of a button to get a wealth of product recommendations — and links to where to shop for them, including local businesses and spas in your area as well as the popular online retailers we all adore. That’s another thing that makes Kind Eye such an interesting concept for an online beauty destination. It’s not actually a retailer itself! Instead, Kind Eye directs you to the best places on the web to buy your green beauty goodies, which means Kind Eye’s index of clean brands is extremely robust — from Acure Organics to Zoe Organics. Besides jumping all over this fantastic giveaway (valued at more than $300! ), I’m excited to jump deeper into Kind Eye as I continue to streamline my beauty routine and green beauty product collection. My first step was to play with the simple recommendations calculator (talk about streamlining!) to see what interesting products Kind Eye found for my beauty concerns.